You are here: Home / Misc. / Black History / Dream Without Limits. 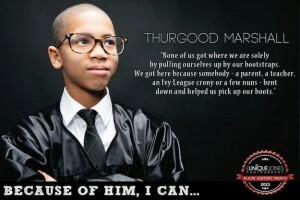 (ThyBlackMan.com) It is beautiful that we see campaigns like “Because of Them We Can”. When I was a little girl growing up we had not publically arrived at that place. Children were taught what they could accomplish from parents, teachers and community members. Sometimes there were those that told us our career options were limited. As a little girl my I began wanting to be President of the United States; my family encouraged this goal, but others let me know that was no place for a black female. I realized, based on reading about our government, that I would much rather be a Supreme Court Justice where I could positively impact the lives of everyday people. As a child Justice Thurgood Marshall was a giant in my eyes. I just wanted to get to the 5th Circuit Court of Appeals so that I could have a perfect record like him, and get appointed to the high court. He helped people. He fought for those who couldn’t fight for themselves. My father took my dreams serious, and introduced me to criminal district court judges in New Orleans. They further encouraged me…even let me sit on their bench and bang the gavel. My dream was on fire. Judge (and later Chief Justice of the Criminal District Court) Calvin Johnson told me “we don’t need any more lawyers, but we do need more GOOD lawyers”. I was able to dream because they existed. I would later to aspire to English, answer my call to writing, and I dream of one day becoming an English Professor. Because of writers and teachers such as: Zora Neale Hurston, Dr. W.E.B DuBois, Toni Morrison, Alice Walker, James Baldwin, Ralph Ellison, and many more I will tell my story. I shall add my words to the tapestry of African American Literature. No matter how big our dream may be the bottom line is: We Can. Videos such as this remind us that we don’t just dream and strive for ourselves…we will one day be the empowerment of a future generation. Someday little boys and girls will want to be like us. The video also reminds us of the power of positive images. If we show and tell our children they can be anything then we assist their dreams. We must take the time to show them those that have done great things, read to them about the ancestors that have impacted change. We must allow them to encounter those that have paved the way for us all…in the hopes that it will spark a fire in them to achieve their own greatness. We must not leave it to our young people to find this spark for themselves. The adult handed them the dreams…therefore we as adults must sow the seed of achievement in our little people. We must nurture their creativity, and believe in the dreams they declare. As we support one another, and encourage each other we can impact our community in a positive manner. One day our kids will be the testament of our greatness. I only hope to inspire my son to follow his dreams by exposing him to ancestors that has paved the way for him. One day I hope to tell him “Because of Them You Can”. We must plan for the future of our future…our children. American Family Insurance will help us insure our families efficiently, as we work to insure the future of our little ones.